World Series MVP George Springer is thanking Houston Astros fans for believing in the team as it rallied to win the franchise’s first championship. Springer told the crowd he was twice told the Astros weren’t supposed to win. The first time was in New York, after the Yankees took a 3-2 lead in the American League championship series. The second time was in Los Angeles when the Dodgers forced a Game 7 in the World Series. He asked the cheering crowd: “How did that work out?” He also encouraged fans to celebrate and enjoy the win. Hundreds of thousands of people cheered on the Houston Astros as the World Series champs spent an hour traveling in fire trucks and double-decker buses during a victory parade in downtown Houston. The parade ended Friday afternoon in front of Houston City Hall, where team owner Jim Crane joined Manager A.J. Hinch and coaches on a stage. Each Astros player was introduced to cheers. The crowd chanted “MVP” as American League MVP candidate Jose Altuve was introduced. Carlos Correa cradled the World Series trophy. Fans draped in orange and blue Astros gear crowded the park in front of City Hall, with many wading into a large reflecting pool amid increasing humidity and temperatures in the mid-80s. 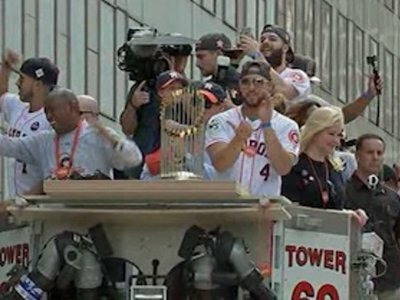 Astros players have climbed atop fire trucks in downtown Houston for a parade honoring their World Series title. The World Series trophy was carried by series MVP George Springer. He planted the trophy at the front of one of the trucks before they started down a route lined with tens of thousands of cheering fans. Four military jets soared above the sea of orange and blue T-shirts, jerseys, pennants and banners. The NASA T-38 jet aircraft are based at nearby Johnson Space Center. Some fans are having difficulty getting into downtown, as Houston’s public transit agency appears overwhelmed by the crush of people using public transportation to attend the parade. City officials had urged people to use public transit because of heavy traffic and limited parking downtown. Transit officials say they’re adding capacity. City officials also quickly extended the parade’s route by a few blocks after more fans than expected poured into downtown. The World Series champion Houston Astros have not made the decision yet on whether to visit the White House if President Donald Trump extends an invitation. Such visits are common for title-winning teams. The New England Patriots, Pittsburgh Penguins and Clemson Tigers have all traveled to the White House in this past year. The Golden State Warriors did not make the trip after being disinvited by Trump. Astros manager A.J. Hinch says the nation is highly polarized right now and the day of the team’s celebratory parade might not be the best time to decide. He says the decision will be made in time. World Series MVP George Springer says he’s visited the White House before and will go if the team goes. Houston officials are extending the parade route honoring the World Series champion Astros after more fans than expected showed up for the festivities. Thousands of people wearing the baseball team’s orange and blue colors are standing more than 10 rows deep along downtown streets, still two hours ahead of the start of the 2 p.m. parade. Others are claiming bird’s-eye views from the upper floors of parking structures along the now 20-block parade route, draping banners down the walls. So many people are showing up that city officials extended the route an extra two blocks. Hundreds of Astros fans are lining up along streets in downtown Houston, hours before a parade to honor the World Series champions. Two of those fans are Manuel Mejia and his 15-year-old son, Jonah. By 9 a.m. on Friday, the pair had set up four foldable chairs at a street corner where they’ll be able to see the start and end of the parade. The parade is set to begin at 2 p.m. The 43-year-old father says he’s been an Astros fan since his father took him to his first Astros game when he was 8 years old. But he also says the World Series win is great for all of Houston, as the city continues to recover from Hurricane Harvey. The Houston school district cancelled classes on Friday so students, staff and their families could attend the parade. Houston is gearing up to pay tribute to the Astros and their World Series triumph over the Los Angeles Dodgers. The new champs will be honored with a parade that starts at 2 p.m. Friday and travels through downtown Houston, culminating in a rally on the City Hall steps. Mayor Sylvester Turner will be the master of ceremonies. The Astros took the series with a Game 7 win Wednesday in Los Angeles. All classes in the Houston school district have been canceled for the day.